Long ago, when I had picked up my first film SLR, I yearned for a built in flash. I was told that only amateur cameras had built in flashes. “Real pros use separate flash units”. Still I wanted one. All I wanted was a simple flash to allow me to use fill in flash when I needed it. You know, just a small amount of flash to bring out the details in what you are photographing to help set it apart from the background. So even though I hated having something extra to carry, I bought a small shoe mount flash and went on my way. As time went by, and I had “upgraded” my first camera a few times, I became obsessed with the idea of being able to photograph a hummingbird and freeze the wing movements. I had read somewhere that in order to do this you needed a camera with a flash sync to shutter speed of at least 250. Well my latest camera then not only had a built in flash but also had that speed ability. But as it happens; photographing hummingbirds and showing stopped wing movements also required at least one more flash and something to put them on, a tripod for the camera and a remote shutter release to help prevent vibrations from your hands on the shutter button from blurring up the image. So with many thanks to Ebay and yard sales my final set up included not only my camera and it’s built in flash, plus tripod and remote but also two more tripods, each holding a flash adapter and a small shoe mount flash. So there I was, able to take photos of hummingbirds with their wings frozen in flight. It was fun but where did it lead me. Actually it only led me to some slides that are buried in a box somewhere in the family room. I was soon to be driven to even deeper forays into the artificially lit darkness. The company I was working for held monthly conferences. 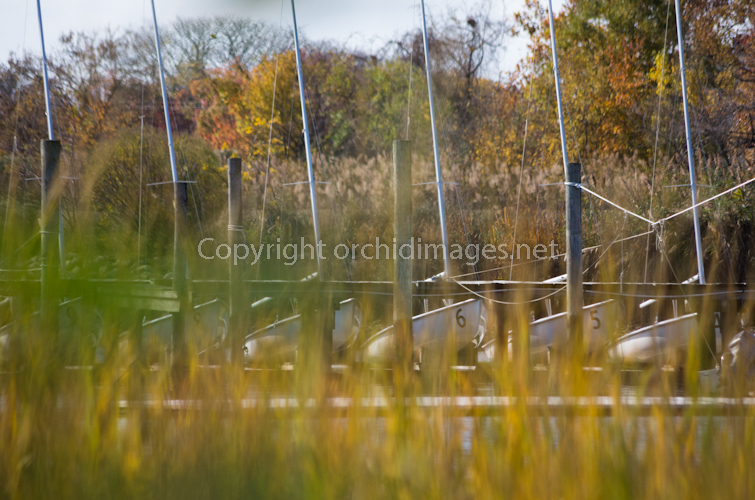 Since I owned the only “Pro” camera and lenses,pro in their opinion only, I was picked to be the official photographer. Only one problem, despite all my various hummingbird flashes I did not own a single flash unit that could properly handle the task. Enter the words “expense it” and soon a flash costing more than my camera was in my hands. I held that position for nearly three years, till someone else got a bigger camera. At least they let me keep the flash. When I left that company for another, the same thing happened. By then I had started using a different brand of camera so the new company bought me a new flash. Seemed kind of strange to me as neither company hired me as a photographer, I figure it was like the only kid in the neighborhood with a basketball being the team captain. My rock bottom in the world of artificial lighting sprang from my love of orchids. 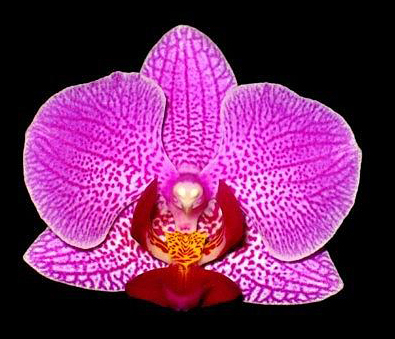 The American Orchid Society bestows awards upon well bred orchids the way the American Kennel Club does upon dogs. Orchids may not be prancing around the ring at the end of a leash but they are shown, singly and in groups at orchid shows. 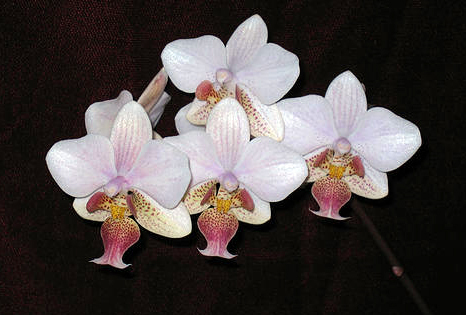 AOS rules state that all awarded orchids must have their photos taken for the record book. At a show put on by one of my local clubs I had the chance to spend an afternoon with the official show photographer and learned how these photos were taken. They needed to be lit without shadows, against a black background. Black velvet is preferred because it will not throw any reflections under the lights. Lights! That’s right lights, not my camera’s onboard flash. Not even multiple flashes. But lights. So once again I was searching for a way to take photos that required artificial lighting equipment. Equipment that I didn’t have. It took a bit of ingenuity, I was on a shoestring then as well, but I finally came up with something that worked. It took a large trifold foam core board. Lots of black velvet, not only to cover the board but also to cover the pot. Clothespins to secure the fabric to the board. Inexpensive shop lights. And willing orchids. But it worked. It did take some practice to keep the colors accurate. I have to admit that I have kept all of my “orchid” studio equipment. Photographing the blooms is one of the few things that I will do without using natural light. So there you have it. My long slide down the slope of artificial lighting. The deeper I went the more difficult it was. And the more expensive. It was a hard climb back up to the natural light again. But I think the results are worth it. This entry was posted in natural light and tagged basics, budget, flash, gear, images, lighting, lights, orchids, photography, photos, shoestring. Bookmark the permalink.